We are not the first people to point out that while you're distracted (Russia? Game of Thrones? current airline scandal? ), things are happening in Washington, DC. No, not that thing. Current attempts to repeal the Affordable Care Act continue to come close without sealing the deal. In the meantime, President Trump and many members of Congress are very much in agreement over another very expensive proposition: increasing spending for the military and war. Some context: even during President Obama's last year in office, U.S. military spending was the highest in the world, more than the next seven countries combined. And, it was high by U.S. standards too: higher than at any time during the 1980s or 1990s when the U.S. was embroiled first in the Cold War with Russia, and then in the first Gulf War. But that's not enough for Trump and Co., who want to take military spending ever higher. How high is high enough? Hard to say. Trump's budget proposal called for $668 billion in military spending, including $65 billion for war spending. House Republicans' budget proposal calls for $697 billion in military spending: including $75 billion in war funding. 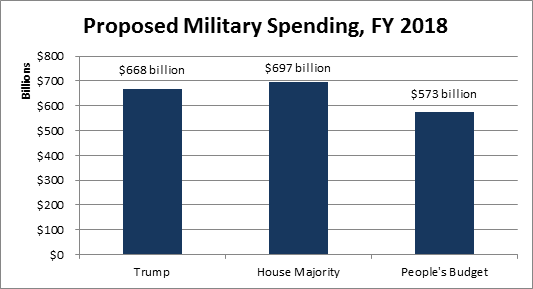 By comparison, the proposed People's Budget calls for $573 billion in military spending in 2018. War funding is zeroed out, and the budget would prohibit sending U.S. troops to Syria. The difference between the highest proposal from the House majority, and the People's Budget proposal is a whopping $124 billion dollars - and that's just this year. To put that in perspective, that's enough to insure nearly 35 million Americans through Medicaid - more than the number of Americans who would lose insurance under the proposed replacements for the Affordable Care Act.